The HD-9 is your rugged, 9,000-lb. lifting solution. Perfect for vehicle storage and service—at the shop or in the garage. Whether you’re a service professional or a DIY’er, BendPak’s got the right lift for you. This model is available with optional casters, dip-trays, jack platform and more. The space-saving design of the 9,000-lb. capacity HD-9 is ideal for vehicle storage in residential garages or commercial buildings. It also doubles as a great service lift for smaller shops who still want to do a big business. 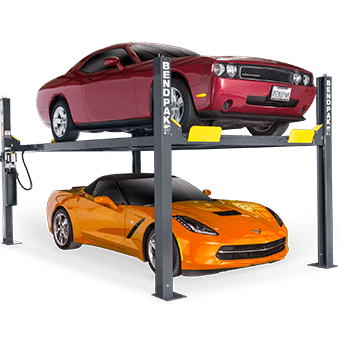 The HD-9 car lift is about the size of a typical parking space and will truly maximize your valuable floor area. Use the HD-9 for storing ATVs, snowmobiles, jet skis, golf carts, boats or just about anything else that needs to be off the ground. Now you can finally make use of that wasted vertical space above your car. If you’ve got at least standard 8-foot ceiling, this lift will work for you. The HD-9 is the standard version of this lift. If you are looking for a narrow-width model, consider the HD-9ST. 4 heavy-duty, high-quality, galvanized lifting cables and a single hydraulic cylinder mounted underneath the runway makes this lift the most durable, maintenance-free lifting system on the market. Reduce stress and fatigue on the axles, sheaves and cables. We insist on using dual-hub cable sheaves, even if they cost us more to make. When you buy BendPak, we throw in peace of mind as a free gift. The HD-9 is equipped with multiple adjustable height locking positions for variable-height parking. A convenient push-button pneumatic safety lock control releases all four independent safety locks simultaneously. Each lift is supplied with 4 high-quality galvanized lifting cables, rated at 14,400 lbs. each. The combined rating of these cables is 640% of the maximum lifting capacity of the entire lift! And we make sure it looks tidy too—all lifting cables are fully enclosed within the lift structure itself. We incorporate maintenance-free electric hydraulic power systems into each lift for ultimate dependability, and all controls are conveniently located within close reach. 10″ x 12″ base plates provide a solid foundation for the HD-9. Each lift is equipped with a single hydraulic cylinder, hidden away under the runway for minimum exposure and maximum reliable performance. Our industrial-grade hydraulic cylinders feature a single-piece, pilot fitted, machined steel piston, wrapped with specially designed, pressure loaded U-cup piston seals, backups and wear bands to virtually eliminate fluid bypass. The micro-smooth chrome-rod is machined from high-yield, ground and polished C-1045/50 micro-alloy steel and plated to a minimum of .001″ diametrically, to ensure superior cylinder operation and life. The superior-design high durometer, mechanically-loaded rod seals make rod leakage a thing of the past while a specially formulated abrasion-resistant urethane rod wiper provides exclusion protection. The welded cylinder body is made from robust steel tubing produced to exceed ASTM specifications. This combination of superb base material and superior processing ensures that the cylinders remain straight, smooth and last a very long time. An integrated flow restrictor provides a controlled descent in the case of an unexpected hose rupture. All HD-Series lifts feature a durable powder-coat finish that gives the metal a high-quality, extremely durable finish which can withstand even the harshest environmental or chemical conditions. Unlike other companies that claim to powder coat, we take pride in our meticulous 10-step process. First, all parts are visually inspected before being sandblasted. Afterwards, the parts are washed in our 5-stage phosphate tanks that can accommodate parts up to 25′ long. Once cleaned, they’re immediately dried to avoid rust production, and then outgassed. Outgassing pre-bakes the parts in a curing oven, reducing the possibility of blemishes that may be hiding in the pores of the metal. If not properly outgassed, imperfections in the metal may bubble during the curing process and most likely will cause chips in the powder. After the parts are washed and outgassed, any surfaces and / or threaded holes that need to be masked or plugged, are done so with high-temperature masking tape and silicone plugs. Next, the parts are given a quick thinner wipe to remove any light debris or fingerprints, before being hung on an electrostatically grounded conveyor line. The powder is finally applied using an electrostatic spray gun. The powder “sticks” to the surface in a fashion similar to how dust sticks to a television screen. Once the parts are powder coated, the carts are rolled into our curing oven and baked at 400° F for 45 minutes. Take your pick. You’re currently looking at the standard-width, standard-rise HD-9. The HD-9ST is the narrow model, the HD-9STX is the tall and narrow model and the HD-9XW is the standard-width, tall model. Lifting cables, airlines, safety latches and sheaves are all fully enclosed. These approach ramps were designed a little longer to help when loading low ground clearance vehicles. It’s the little bit that makes a big difference. Aircraft-quality stainless steel and aluminum pneumatic cylinders release all 4 locks simultaneously with the simple push of a button. The spring-loaded safety locks automatically engage continuously as the lift is raised. For added safety, a secondary lock system acts as a slack-cable device to engage in the unlikely event of cable failure. *Not all BendPak lift models meet the standards as prescribed by ANSI/ALI ALCTV-2006 or ANSI/UL 201.